If you read my blog often, you know how I feel about oatmeal. Instant, baked or microwave - it all works for me. Clean eating is important to me and I try to do it as much as possible. By starting my day with a healthy bowl of oats I am more likely to stick with my plan and make healthy choices the rest of the day. This oatmeal couldn't be easier to make and it tastes delish! Ripe banana adds just the right amount of sweetness and makes the oats extra creamy. Slice or mash banana into a microwave safe bowl. Top banana with oats, milk and cinnamon. Microwave on high for about 3 minutes (stir oats after 1 1/2 minutes). Mine faves are almond butter, dried fruit, fresh fruit, nuts or shredded coconut. This oatmeal sounds delish Lynda, I'm much too boring with my oatmeal! Loved meeting you this weekend at Mixed! Thanks for your help! One of the great recipe i ever explore. 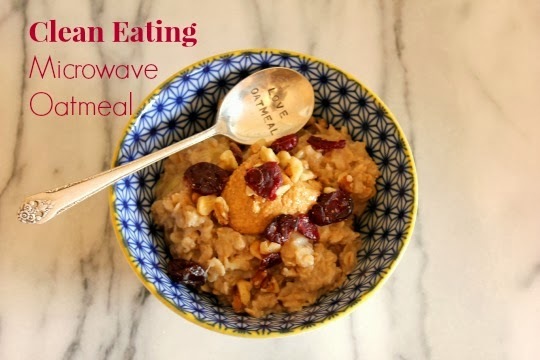 I also like to experiment this oatmeal using my microwave.